Day Two of the Newsletter's coverage exposes the lies perpetuated by the 'mystery witness' amplified by Sinn Fein activists. Today the Newsletter exposes the unsubstantiated allegations made by the ‘mystery witness’ that breathed fresh life into the ‘collusion’ allegations around the Loughinisland massacre. The allegations were amplified by Mr McCaffrey- who is pictured below at an IRA commemoration in Castlewellan- on the online news platform The Detail. Mr McCaffrey has had a long and credible career in journalism, it appears however in recent years he has devoted his journalistic capabilities to nationalist activism. When asked in the ‘No Stone Unturned’ film how one of those named in the discredited documentary reacted when he put the allegations to them, McCaffrey- forsaking all professionalism- giggles and remarks “he shite himself”. This boastful unprofessional remark came prior to a tearful Mr McCaffrey addressing the media after his arrest last year. The Detail is entwined with the company behind the ‘No Stone Unturned’ film, Fine Point films which in turn is a sister company of James Street films- of which Niall Murphy and Fine Point Film’s Trevor Birney are both named directors. These allegations came at a time when Sinn Fein were looking to get a foothold in South Down and oust the SDLP, whose local elected representatives had acted as spokespersons for the families for many years. 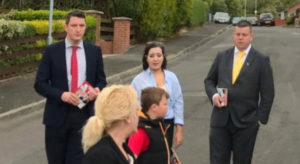 With the new allegations filtered through Nationalist activists Barry McCaffrey and Sinn Fein activist Niall Murphy, the republican party became the main political spokespersons for the families. That she saw the car speeding away- at night time in the dark- and got a good look at the driver who she identified as an individual who not only had absolutely no involvement in Loughinisland, but was in prison at the time of the attack. That the getaway vehicle was stored at the home of an RUC officer- she said she was able to instantly spot the vehicle which she had seen ‘speeding past her’ in the dark nine years previously after random lifting a tarpaulin covering the vehicle whilst at the RUC officers home. The Newsletter also publishes an extract from a leaflet printed by nationalist lawyers which repeated all of the allegations made by the mystery witness- despite them all ultimately turning out to be entirely false. Interestingly within the leaflet the authors claim to have been given “official documentation that shows that ‘Person X’ benefitted from a Royal Prerogative of Mercy”. The list of those in receipt of OTR letters and Royal Pardons is classified, yet there is no apparent explanation as to how nationalist lawyer Niall Murphy obtained this information. Police and Ombudsman investigations all discounted the allegation that ‘Person X’ had anything whatsoever to do with Loughinisland, in fact it is understood he was in prison at the time. Despite this KRW Law published the entirely false allegations within their Loughinisland leaflet. The individual spoke out in a Sunday Life interview in 2017 in relation to allegations around his business affairs. It is not the first time that documents have been leaked to nationalist law firms. In 2013 a former HET Detective Steve Hobbs was arrested for the theft of classified documents from the HET. It is alleged that Hobbs was systematically passing copies of HET reports and notes to another nationalist law firm for which he was allegedly paid a retainer. Although he was not prosecuted, Hobbs made admissions in a 2018 interview with the Belfast Telegraph in which he revealed what he had taken with him when leaving HET “It was all my day books on everything that was going on, my thoughts, my rationale regarding investigations, details of meetings,” he said. “I had copies of reports that I had written. Some of them were sensitive, in fairness, around some cases which were probably quite controversial in Northern Ireland”. The former detective also made clear that he had notified his superintendent that he was taking his notes and documents upon his leaving the HET. It has been claimed by nationalist legacy activists that the controversial stolen Police Ombudsman report, which formed the basis for the ‘No Stone Unturned’ documentary was anonymously posted to Barry McCaffrey. It is understood however that the suspect list, allowing the nationalist activists to identity the persons behind the ciphers, was actually copied in the Ombudsman’s office and then transcribed. For the material to benefit from journalistic privilege it had to have been held continuously for the purposes of journalism, therefore the story of the material being anonymously posted was contrived. It was at this point that the realisation became clear that the allegations around ‘Person X’ were wholly false, at which point the nationalist legacy activists simply pivoted to new allegations.